When people make lists of the best RPGs of all time, it's not uncommon to see several JRPGs from the SNES and PSX eras on that list. While games like Final Fantasy and Dragon Quest are popular enough to be household names, one title that frequently pops up with somewhat less recognition is the one and only Chrono Trigger, released for the SNES in 1995 by the developer formerly known as Squaresoft. Known for making one of the most critically acclaimed and popular JRPG franchises of all time, Final Fantasy, Chrono Trigger had a lot to live up to in order to be listed among them in terms of popularity or influence. When it was first released, Chrono Trigger received rave reviews and even today is listed as one of the greatest games - not just JRPGs - of all time. However, these opinions are based on the time the game came out and they do not necessarily reflect its status today compared to other games. This raises an important question: does Chrono Trigger still deserve such high praise, or has its charm been, pun intended, lost to the flow of time? WARNING: This review contains spoilers! Read at your own risk! 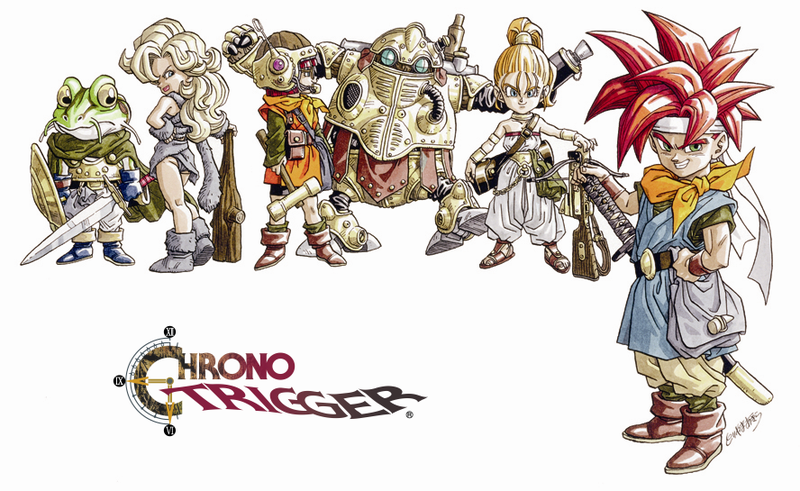 For those of you unfamiliar with it, Chrono Trigger is a game where you play as Crono, a traditional, voiceless hero that you can name yourself, on an adventure where you travel through time in order to save the world from impending doom. Along the way you gain new companions and fight various evil villains in order to increase your abilities and use them strategically. This is done through a relatively traditional battle system similar to the Final Fantasy games from IV through IX, based on the Active Time Battle system, to be explained later below. In general, the game has quite a lot in common with Final Fantasy in spirit, but there are numerous differences in execution, many of which influenced the genre, especially its then-unique time travel features. First and foremost, lets talk about what I felt was the most important aspect of the game, and what you'll be doing for the majority of your adventure: fighting enemies. Combat is rarely something that is thought about rather deeply when designing or even reviewing a JRPG. Most gamers and critics focus on the story and aesthetics above all else, considering the raw gameplay itself to be the part of the game that prevents them from feeling like they're watching a movie. In the case of Chrono Trigger, not only is the gameplay the main focus of the experience, but I found it to be superbly forward-thinking in terms of design in several ways. Among the many things that Chrono Trigger does differently from most other SNES-era JRPGs is that there are no random enemy encounters. Many other JRPGs of the time, and even many today, frequently made use of a "random encounters" system where unseen enemies popped in at seemingly random intervals as you explored in order to simulate danger and being attacked. While this worked in older games where processing power or other limitations forced the designers to think creatively about how to have the player engage in battles regularly, as time went on, the concept quickly grew stale and archaic. I have never met a single person who honestly preferred random encounters to more static ones for reasons other than nostalgia, and Chrono Trigger helped to move the genre forward by being one of the first few notable games to ditch them. Since encounters were no longer random with Chrono Trigger, this meant that enemy encounters were, instead, planned out as if they were specific challenges for the player to pass, not unlike many later RPGs such as Final Fantasy XII, XIII, the Kingdom Hearts series, and even many WRPGs (Western RPGs) like Fallout or Baldur's Gate. Each enemy you fought in Chrono Trigger was a specific instance that occurred at a specific point in each specific area at that specific moment in time (due to the time travel system). In addition, when you traveled through a dungeon on your way to fight a boss, many enemy encounters would not occur twice, allowing you to walk through any cleared rooms without annoying consequences that could lead you to becoming over-leveled. While there were several areas where enemy encounters would respawn after leaving and entering the area again, the fact that some enemy deaths were permanent changed a significant detail about the game design that made me enjoy it more than most other games of its time: there is little, if any, grinding ever required of the player. As long as you fight as many enemy encounters as the game throws at you up to that point, you will never be under- or over-leveled and it was much easier to manage your party this way. The only times I ever had significant trouble on bosses throughout the main storyline were when I didn't have a well-balanced party and needed to re-think my strategies. Defeating a boss or enemy, then, felt less like the result of my level, equipment, sheer patience, or ability-spamming, but more of a result of my skill as a player. If you did everything "right" up until any boss fight, and even some enemy battles, the only way you could succeed is if you clearly knew what abilities and techniques you had at your disposal and how to apply them. Many bosses and enemies could not be defeated by simply mashing "attack", though quite a lot of simple enemies do die that way anyway. Since battles are the one thing you do most in JRPGs of this nature, I've always tended to prefer games that focus on making the battles focused and enjoyable over giving you lots of them with little thought put into it, and Chrono Trigger definitely succeeds in this area outside of some nitpicks which are relatively minor compared to its refreshing successes. The actual battle system itself is the Active Time Battle system from Final Fantasy tradition, but with some changes. Originally developed for Final Fantasy IV by Hiroyuki Ito, the Active Time Battle system changes combat to a semi-turn-based system where turn order is dynamically decided based not only on the speed of your characters, but the speed of your input. Over a period of a small number of seconds, a bar fills up for each character according to their statistics, and once it's full, you select which move they can do. If multiple party members have their ATB meter full at the same time then you can choose who takes the next turn, and in Chrono Trigger's case you can use multiple characters' turns for a "Tech" attack, explained later. Unlike Final Fantasy pre-XII fights take place on the same field as movement, so enemy positioning is also taken into account. Some moves only attack one target, and others attack all targets, but Chrono Trigger introduces moves that attack targets in a specific range. For example, you can attack in a straight line, or in a circular area around an enemy. You can even throw enemies at each other and have other various effects. Each of these have multiple situations where they'll be more useful than other attacks, and when coupled with the constant level of challenge the game presents that doesn't rely on grinding, you'll often have quite a few situations where a bit of thinking is necessary. While Chrono Trigger is not a very deep game and it doesn't get so challenging that you'll be completely stumped or die repeatedly, it does a very good job of making sure that you have to be paying attention during battles, something that I rarely find in JRPGs outside of SRPGs and the more recent Square Enix titles such as Final Fantasy X, XII, and XIII with their heavy focus on combat. In battle, in addition to a generic "attack" command, you can use abilities called "Techs" that you activate by spending TP, or Tech Points. These behave similarly to other special skills, spells, and abilities in other JRPGs (think "mana" or "MP") so they require little explanation outside of the fact that they all have unique effects that you can use to your advantage in battle at the cost of a number of points. Each of these abilities is gained by using your party members in battle instead of leaving them on the side, though they still gain levels and experience without learning abilities. By using a specific team frequently you can also unlock double and triple techs which utilize multiple party members in specific combinations to do even more damage or have wider areas of effectiveness. In theory this sounds like a great idea, and for a portion of the game it is, but as you get more abilities as the game progresses, they become increasingly less efficient. Partway through the game I realized that the damage you do with these double and triple techs, which require sacrificing the turns of multiple party members, do less damage than simply using techniques with multiple party members in sequence. Not only that, but using multiple moves instead of one gives you more flexibility in case you suddenly need to heal a teammate from an unexpected attack. That said, the game does use them to good effect at several points, such as throwing situations at you where you'll want to attack every enemy with an ice attack when the only way to do that is with a double tech. However, the lack of balance through the entire game quickly makes them obsolete and an interesting idea that doesn't quite follow through. Overall, combat in Chrono Trigger is rewarding and requires you to be paying attention, but it feels like it could have been tweaked ever so slightly more to feel more balanced for the entirety of the game. I greatly enjoyed my time with the battles but after you get more powerful abilities it sadly falls into a trap that many other JRPGs also fall into where your more powerful abilities completely overshadow your other techniques, making the game seem simpler and easier as a result. Thankfully this doesn't happen until very far into the game and Chrono Trigger provides an almost constant level of well-done fights that feel well-planned out instead of generic filler. If you like well-done combat in JRPGs, you don't even have to read the rest of the review since this game has it in spades and would make up for any other potential downsides that the game might have. The biggest draw to Chrono Trigger for some will not be the relatively polished combat, but the intriguing time travel system prevalent throughout both the storyline and the entire game world itself. Shortly after the introduction of the game, your party is sent many years into the past, being able to go to areas with many different people and general details relative to when you start out. Later on in the game you'll find yourself going to a wide variety of locations in many different time periods, including the age of dinosaurs and even a distant, post-apocalyptic future, and the game world changes its appearance each time to reflect these differences; prehistoric times have the continents in a sort of Pangaea-type arrangement, whereas later years show further and further separation of continents and, in the case of the post-apocalyptic era, a charred, barren landscape of destroyed civilization. Later on in the game you'll gain the ability to travel to nearly any time you wish on a whim, which is very convenient for general exploring as well as tying up loose ends. One of the ways that the game incorporates this time travel mechanic is by allowing events in the past to change the future, not unlike The Legend of Zelda: Ocarina of Time, though this game was released a few years prior. Most of the time, your actions only change things as the plot desires, but there are a few side-quests where you can do some notable differences in the years to come. My favorite use of this mechanic has to be how treasure chests work. If you open a chest in the present, for example, and you go back to the past where that chest is still unopened, then you can acquire its contents twice. The reverse doesn't work, however, because once you open a chest in the past it obviously remains open in the future. This shows that the game wasn't lazily designed at all and that the developers felt like making time travel feel as real as they possibly could within the technical limitations of the SNES. The game records your actions in a few other ways as well. Most notably, almost as a demonstration of this feature, the beginning of the game has you, Crono, in court due to certain events at a local fair. Depending on what you did at the fair beforehand, the citizens will give a different testimony. I was honestly shocked that it took some decisions that would have been arbitrary in other games and made them seem like they made a difference. That said, the testimony has no effect on the outcome and you are always thrown in jail, but that doesn't stop it from being extremely charming nonetheless. Most importantly, the game allows you to experience multiple endings depending on when you choose to face the final boss, Lavos. This decision is granted to you because you're allowed to travel through time at will, so it would make sense to not be forced to face him at a certain time when he only destroys the world once. Thirteen unique endings are available for players to experience, with a bonus ending if you play the DS version of the game that has ties to its sequel, Chrono Cross. Each of these endings are rather entertaining, though the quest to get all of them is unfortunately a little long. The game has a "new game plus" option after finishing it where you keep your items, stats, levels, and virtually everything else as you play through the game again. Since the game is only about 20-25 hours long, it's not that much of a trek compared to other games, but the challenge does not persist through this new playthrough as a result of keeping your stats and items. Since you were able to defeat Lavos, the most powerful encounter in the game, the first time around, the game gets painfully easy the second, third, and especially fourteenth time through. Back when the game was released, being able to view all of these endings was seen as a privilege that few players could experience, but now you can view every single ending in a little over an hour on YouTube. This particular part of the game, while definitely ahead of its time, did not think far ahead enough to make the endings seem like a proper reward for your actions and instead come across as being tests of your patience rather than your skill. I would have bothered to get every ending had the game remained challenging somehow, but since that is not the case, I'm left significantly disappointed, but that does not make the endings any worse at all. In fact I quite enjoyed them for various reasons and it showed that the developers put a lot of effort into giving the players of this game in 1995 something special as a reward for their dedication. At this point the only other notable features to talk about are the bonuses present in the PlayStation and DS versions of the game that enhance the experience relative to the original. The most notable difference with these versions are the inclusion of several anime cut-scenes during parts of the game in the same style as the character artwork, not unlike Dragon Ball. While I have not played the PlayStation version, the DS version presents these cut-scenes in a more than acceptable format with good visual quality. Purists that would rather experience the game in its most "original" state should note that, at least in the DS version, you are given the option of turning them off completely, though these cut-scenes always play immediately before the in-game version of the same scene, so you're always given both views of every scenario. The DS version also has new control options that make the game more enjoyable with the touch screen, including moving nearly all information outside of the playing field to the bottom screen so you can easily tap the options you want. This is much easier and much more visually pleasing than the older configuration, and it makes the game more enjoyable for me as a result. These menus are still navigable with buttons even while on the second screen and the added width and height of the buttons, move lists, and so on make what's happening during battle as well as move selection much more clear. Outside of battle, you're also given a self-completing map on the bottom screen for every area, which is definitely a nice touch for the few areas when it is potentially helpful. Two bonus dungeons were also added for the DS version, one of which ties in to the new fourteenth ending, so if you want to get the version with the most content (and the least amount of loading times), the DS version is definitely the best version to get since it includes options to emulate the old SNES and PS1 experience in addition to providing a much-appreciated UI revamp for the DS' two screens. Of course the game also does have versions for smartphones based on the DS version, so those are also options, but I'm not very familiar with them and I cannot say anything positive or negative about them specifically. The first thing that many people will notice about Chrono Trigger is how the character designs might remind them of Dragon Quest, Dragon Ball, Blue Dragon, or any of Akira Toriyama's other famous works in terms of at least character design. While some people have frequently expressed grief at seeing these similar character designs over and over again throughout the past several decades, I found them to be quite charming and, at least in the case of Chrono Trigger, relatively original compared to other games. Toriyama designed the look and feel of every monster, area, era, vehicle, and character in the entire game, and it clearly shows with colors that pop and environments that feel genuinely artistic. Along with Final Fantasy VI (III in the West for its original release), Chrono Trigger is considered by many to be one of the most beautiful games on the SNES for its uniquely detailed aesthetic and design, and even on the other versions of the game years later it still has quite a lot of visual appeal in this way. Though aesthetics can often be a matter of taste, assuming this game's visuals do not appeal to some people, these people would be hard-pressed to deny that a lot of effort was put into the game world, and that's commendable no matter what you think of the art style. Musically the game was composed almost entirely by relative newcomer Yasunori Mitsuda, with some tracks scored by the famous Final Fantasy composer Nobuo Uematsu and one track composed by both Uematsu and Noriko Matsueda. Since the majority of the game was composed by a new composer, the game had a relatively fresh style compared to Final Fantasy or even Dragon Quest games. The tracks presented here are rarely anything more than simple melodies, but that is not to say that they're not atmospheric or even emotional. Every track feels like it fits the location very well, with many tracks being exclusive to certain eras in time in order to set the general feel. Unfortunately this is one of the harder things in the game to properly judge and criticize considering how I am not a music critic and I can only rely on my gut feeling, so later on in this review I will link to several of my personal favorites from this game so you may see exactly what I mean when I say that the soundtrack is quite good and memorable, even today. Overall, the general presentation of Chrono Trigger definitely sets it apart from other JRPGs of its time and even generations to come. I wouldn't go as far as saying that it "has yet to be surpassed" or even that it has "some of the best artistic design ever". That would be a huge disservice to so many other amazingly beautiful games that I've played over the years, but Chrono Trigger does have an undeniably high amount of timeless charm in its presentation. The enemy and character designs are all inviting and lighthearted, the soundtrack is catchy and thematically appropriate, and even though I find many other games, even JRPGs, to be significantly better than Chrono Trigger in both of those departments I still found quite a lot to enjoy about Chrono Trigger's atmosphere. Even if I didn't enjoy the gameplay nearly as much as I did, I'd still play along until the end simply because of how charming the game world was at times, in addition to the entertaining writing and storytelling. Playing a JRPG and not caring about its storyline would be like reading a fantasy novel for the battle scenes. As fun as they might be, the real reason you're here is because JRPGs are like a kind of interactive narrative that you partake in every step of the way. JRPGs are not known for player freedom compared to WRPGs like Fallout or D&D, often making the player perform tasks in the same way that the in-game character would without much freedom. There are no systems of morality, no large dialogue trees, no "being" any character since they are all pre-written for you, but in the case of Chrono Trigger I wouldn't want it any other way. Chrono Trigger is one of the better examples of how to make a compellingly interactive narrative, along with nearly every Final Fantasy title (mainly excluding the pre-IV games). As mentioned previously, there are a few segments during the game where your actions as a character make a difference in the story, from a trial to completely different endings. These moments are few and far between, and I honestly can't recall any more than those two examples and a few sidequests, to be described later. The first thing that I should note about the story is that there are two official translations for the game: the original English translation for the SNES and the completely redone translation for the DS release. Ted Woolsey, the (in)famous translator for many SNES-era JRPGs, was forced to complete the original translation in only 30 days. This translation was kept for the PS1 release as well, but the DS release was almost entirely re-translated, which stays true for all subsequent ports to smartphones. Many things are kept similar to the the original translation, such as character and location names, but many other details were changed to better reflect the original Japanese writing's intentions. While I am not particularly familiar with the earlier translation, the new one is definitely very readable by modern standards and makes the game feel less "foreign" and awkward compared to other SNES-era JRPG translations. The game story follows Crono, a boy who gets caught up in a series of events that leads him and some friends to travel through time and save the world from impending doom. This impending doom, Lavos, is essentially a parasite from space that can destroy worlds. Unfortunately, this means that Lavos has little-to-no character development and the final showdown only happens out of necessity. Compared to more memorable villains such as Sephiroth from Final Fantasy VII or even Jecht from Final Fantasy X, Lavos doesn't even hold a candle, and I never felt compelled to defeat him other than the urge to get the game over with. In addition, many other enemy characters are rarely developed to be more than power-hungry tyrants, seeking to abuse Lavos' power for their own ends. The problem with these types of villains is that they're extremely easy to write and integrate into a game and they never make me, the player, think of them as anything more than targets for me to eventually attack. There is one notable exception to this, however: Magus, an enemy who can optionally become a full-fledged party member with his own story that's quite a bit deeper than the rest of the shallow villains. What exactly happens with him will be up to you to discover, but you might be quite surprised. It's nothing like the plot-twists of other famous games like Metal Gear Solid, but it never feels tacked on to the story and it made me care for the character more than I thought I could previously. The game's story is broken up into several chapters which take very little time to complete. As I mentioned above, the game is only about 20-25 hours long if you complete every sidequest, so it's a good game to play if you don't want to spend 40-80 hours doing the same general thing. These "chapters" aren't actual chapters, rather, but just general areas of the game that feel episodic in nature. Playing Chrono Trigger feels like playing an anime series at points because the episodic feel to the storyline separates each "chapter" fairly consistently. It rarely took more than an hour to get through a chunk of the game, often less than that, and for a game that's playable on the go with the DS port I found it very fitting compared to much more involving games that demand long periods of attention from you like Demon's Souls or even Final Fantasy. That said, I'd often feel burnt out after playing through more than one of these "chapters" in a day, maybe because I felt I was rushing through the game when I could be soaking it in, but there's not very much to soak in if you're looking for a longer game with tons of variation and bonus content. Despite the game spanning several eras, the game world is rather small. The areas you visit are often very minor in size outside of the occasional dungeon, which made me feel like the game could have used a little more fleshing-out at points. While it's understandable that there wouldn't be much of a civilization millions of years ago, there is one particular era, "Antiquity", where humanity has achieved the impossible by building a floating city with advanced technology and magic. This era is barely explored outside of a few key plot points and I felt that the few areas you can look around in, coupled with the relatively generic villains over the course of the game, made me feel like there was a lot that the game wasn't telling me about the world I'm tasked with exploring. Even though the game world is slightly shallow compared to larger RPGs, that's not to say that it's not fun. The story is filled with funny and creative moments that make it feel like the writers had a lot of fun with the game, though not to the same extent as the notoriously silly Paper Mario games. Along the journey you'll be partnered with Marle (a princess), Lucca (a geeky girl), Frog (an ancient warrior who is, as the name implies, a frog), Robo (an abandoned robot from the future who lacks the capacity for emotion), Ayla (a prehistoric cave-woman who packs a mean punch), and Magus (a sorcerer who joins you later in the game with a dark past). Each of these characters has their own backstory that is addressed both during the game and during special sidequests. Each of the sidequests that I'm referring to are only accessible very late in the game and are rather hard to find without proper guidance. This is one of those games where a guide to point you in the right direction would not be unwarranted, which is somewhat excusable considering the game's age but it's disappointing nonetheless. Overall I found the story of the game to be generally charming in several instances, especially the introductory scenes (such as the oft-mentioned court scene) and the sidequests, but I couldn't help but feel like the plot and characters were a little shallow and simplistic relative to other JRPG greats. Don't let that stop you from playing this game, though, because there are plenty of fun moments to be had and I would hate to spoil that all for you by describing every fun little moment that occurs over the course of your adventure. Chrono Trigger is a very interesting game, but mostly in a good way. Compared to games of its time it absolutely shines with great gameplay and presentation decisions that make it a joy to play, but compared to contemporary games it only barely holds its own, and that's only in the area of its very forward-thinking combat. If you're going to play one SNES-era JRPG, however, I would absolutely recommend this game for having many elements of a timeless classic that was quite far ahead of its time when it was released in several aspects. It would be hyperbole to say that it is unmatched and there are definitely a few things it can improve on, but almost every great game is like that and Chrono Trigger is no exception. I would recommend it to literally anyone who enjoys JRPGs new and old as it has several aspects that are similar to both while feeling distinctly old-school at the same time. If you do pick it up I would absolutely recommend the DS version (or the smartphone releases) above the earlier two because of the significant advancements they add to an already great game. I have not played any of the others, however, but I'm sure that they're all great at least because of how enjoyable the original game itself is without any minor bonus content. I mentioned earlier how the soundtrack of this game was quite enjoyable but hard to adequately criticize, so instead I will be providing a few notable examples that I feel describe the overall feel of the game very well. This review was delivered quite a while later than I originally intended due to my busy schedule for the last few weeks of school as well as me underestimating just how much effort I wanted to put into these reviews. Currently I am working my way through Final Fantasy X so I would love to review that eventually, but the next spot will most likely be something I'm already finished with like Mega Man X, Metal Gear Sold, or even another Final Fantasy title. What games would you like to see me review next, if any? Any critiques or comments on the structure of this review that I can take into consideration for the future? Thank you for reading this since it took quite a lot of effort to actually put together the way I wanted it to be, and I look forward to writing the next one!